Looking for more energy, better mood, less feelings of overwhelm, sleep improvement, a healthier life, seasonal relief, balancing body systems, and toxic free solutions? Then essential oils may be the answer to all of these needs! I wasn’t a skeptic when it came to oils. Many say they were, but that wasn’t the case for me. I was someone who knew the concept of oils had amazing potential, but it took me some time to really turn to them as I have now. I’m a knowledge hoarder, so taking my time to learn more, research, and ask trusted people for their perspective – was essential. I’ve been on a journey to live a healthier, more natural life, for some time now. It’s a process, not something that happens overnight. I want this to stick-so I started a few years ago and my plan is to turn our household into a totally natural and healthier-for-us environment. After a few years of switching up products in my home to healthier-for-us options, I was ready to take the plunge and learn as much about oils as I could. I heard so many great things about using oils: more energy, better mood, less feelings of overwhelm, sleep improvement, a healthier life, seasonal relief, balancing body systems, and toxic free solutions. I wanted in on all of these things and oils proved to be the rout to go to help me continue improving in all these areas, in a way that was natural. There are so many oil companies around, so choosing which one I would use for my family wasn’t an easy choice. I had tried other oils from other companies before, and didn’t like them. They didn’t deliver on what they claimed. And after doing some research, I learned that oil brand matters because not all companies create their oils the same. Sometimes fillers are added and other times they source their oils from questionable manufactures. The questionable part comes into play as far as growing their resources in regions where these don’t naturally thrive in. For example, growing a palm tree in the middle of your mid-west suburbia back yard will create a very different palm tree than one that grew in it’s natural, tropical environment. Sure, both may be called the same – but they are very different in their genetic composition. So, sourcing matters. Validity in sourcing matters. With Young Living, they have farms all over the globe which is why they offer so many great varieties of the best oils on the market. You can even visit their farms! At first, I didn’t realize I could build my Young Living oil stash without becoming a seller. But then, a friend told me that signing up to get wholesale benefits does not equal having to become a seller. At that point I was like – wait, so why wouldn’t I do this? So, I ordered my starter kit (it’s how you sign up or get your “in” to the wholesale status) and started using my oils. Essential oils are used in three ways: through aroma, through topical application, or through consuming them internally. This is why sometimes you catch a whiff of something and you are suddenly reminded of a moment that happened decades ago (2, 3). The limbic system also plays a role in affecting some other things such as breathing, heart rate, blood pressure, physiological functions. You can do this by adding a few drops to your hands and then just breathing that in by cupping your hands around your mouth and nose as you inhale. Topical use, probably the most common way to use oils, is when you apply the oil to your skin. When applied to your skin, you are allowing your skin to absorb the properties of that oil. For example, if you are outside and suddenly get a bump and are itching it like crazy. Apply some Lavender and the properties found in the oil will absorb into your skin, causing a soothing sensation and will likely eliminate the itch and reduce the bump. Though applying topically, you also still reap the benefits of aromatic use. Some oils work best for you when applied to your temples, neck, behind your ears, etc. Others work best when applied to your forearms. Some oils are pretty potent, so using a carrier oil helps adjust the potency. And this varies person to person. For example, some of my family members can use Thieves straight on our skin, but others in our family need to dilute it in a carrier oil. It’s a hot oil, so different people react in different ways. You can use their Vitality oils topically or aromatically too of course, but these are the labels you’ll want on the oils you use internally. I love this about them, it makes it super easy to know what can be ingested and what can not. They have other kits – and they don’t all have to be oils + diffuser either! Some are of makeup and others are of household cleaners and others are a combination! So depending on where you are starting on your healthier lifestyle journey, there’s a kit and loads of products for you! Here’s the difference between the oils and products of each of these kits listed above. The first one, remember, is being retired soon so this new one can take it’s place. So, if you want that first kit – get it now before they run out of stock! READY TO BENEFIT FROM WHOLESALE PRICES? One of the things that held me back from signing up for as a wholesale member was because I thought it meant I had to do something each month (like get someone to buy something from me), in order to keep that status. But guess what? You don’t! There is only ONE requirement: Sign up by ordering one of the starter kits I’ve shared above. You can find them all through this sign up link. WHY do this? SAVINGS & FREE STUFF! If you are wanting to start adding oils to your daily routine, you not only SAVE money (24%) by just simply signing up as a wholesale member vs shopping retail pricing, but you also earn points each month with your order if you’re on Essential Rewards. What’s the Essential Rewards Program? Essential rewards (ER for short) is like signing up for a subscription service. You get a percentage of your order back as points, each month. You also get freebies every month. The longer you’re on this program the more points you earn back each month. BUT – you do NOT have to be on this program in order to reap the rewards of wholesale pricing! I think it took me a couple of months to sign up for ER. I wanted to get a good feel of the oils that I got in my Starter Kit and test out some other ones I was really interested in like Progessence Plus Serum (specifically formulated for women to help support our unique female systems). Another one I wanted to try was R.C. Essential Oil Blend due to hearing it was a great oil to help breathe better. Interestingly, I found that Raven Essential Oil Blend worked best for me in this area and it’s what I use now. And, Raven Essential Oil Blend was in my starter kit! The best advice I can offer is to find five oils in your starter kit that you love, and one more that’s not in the kit. Learn a lot about them and their uses. Become comfortable using them. Once you do, and you will, you’ll be ready and confident to keep exploring more oils! You can also contact me via my contact form OR shoot me an email at [email protected] with any questions! Once you sign up under me, I’ll get in touch with you to add you to a private Facebook group called The Living Room. This group is fill with essential oil users from novice to experienced. 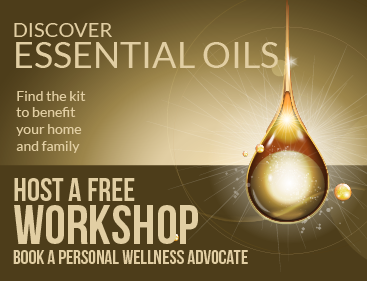 It’s a fantastic group to ask questions on how to use your oils or what oil can you use for a specific need! It’s also a great group to continue learning since we are all sharing our experience. The group is for women and men, so if you have any questions about oils for the man in your life – you’ll be able to get a lot of great feedback from men who actually use the oils!